Sure, your home may not be located in a high flood risk area but did you know that 25% of flood losses happen in low to moderate risk areas? That means you can be a victim of flood damage too! Call 866-869-3335 To Get the Right North Carolina Flood Insurance Protection For You at the Lowest Cost! Just an inch of rain in a very short time can cause a flash flood in many parts of North Carolina. But when the rains continue to fall like they do in severe storms, flooding become widespread and can do millions of dollars in damages including flood damage to your home. Do you remember the floods caused by Hurricane Fran that dumped 16 inches of rain as far inland as Raleigh, NC? Thousands of homes were flooded and most of the homeowners were left without North Carolina Flood Insurance coverage. What if Hurricane Fran or any other hurricane of the same magnitude hit your part of North Carolina? That’s right, you must buy a separate policy and the good news is it’s inexpensive for homes that are not in flood prone areas. You can buy a North Carolina flood insurance policy for as little as $20 a month. Great peace of mind at a low cost. North Carolina Flood insurance is available through Paramount Insurance Agency right here in the Piedmont Triad. The coverage is provided by the National Flood Insurance Program and there is a 30 day waiting period before coverage can take effect. Don’t wait for a pending storm. Buy North Carolina Flood Insurance today so you will have the protection you need when the big storm hits. 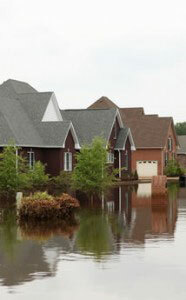 Let Paramount Insurance protect your home with the right North Carolina flood insurance today. Whether you live in High Point, Greensboro, Winston Salem, Raleigh or any where else in North Carolina, you’re at the right place. Call us today!